The music of ancient Greece was almost universally present in their society, from marriages, funerals, and religious ceremonies to theatre, folk music, and the ballad-like reciting of epic poetry. It thus played an integral role in the lives of ancient Greeks. There are significant fragments of actual Greek musical notation as well as many literary references to ancient Greek music, such that some things can be known—or reasonably surmised—about what the music sounded like, the general role of music in society, the economics of music, the importance of a professional caste of musicians, etc. Even archaeological remains reveal an abundance of depictions on ceramics, for example, of music being performed. The word music comes from the Muses, the daughters of Zeus and patron goddesses of creative and intellectual endeavours. Music played an integral role in ancient Greek society. Pericles' teacher Damon said, according to Plato in the Republic, "when fundamental modes of music change, the fundamental mores of the state change with them." Music and gymnastics comprised the main divisions in one's schooling. "The word "music" expressed the entire education". In Greek mythology: Amphion learned music from Hermes and then with a golden lyre built Thebes by moving the stones into place with the sound of his playing; Orpheus, the master-musician and lyre-player, played so magically that he could soothe wild beasts; the Orphic creation myths have Rhea "playing on a brazen drum, and compelling man's attention to the oracles of the goddess"; or Hermes [showing to Apollo] "...his newly-invented tortoise-shell lyre and [playing] such a ravishing tune on it with the plectrum he had also invented, at the same time singing to praise Apollo's nobility that he was forgiven at once..."; or Apollo's musical victories over Marsyas and Pan. the Pan pipes, or syrinx. 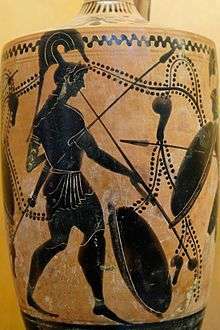 There are many such references that indicate that music was an integral part of the Greek perception of how their race had even come into existence and how their destinies continued to be watched over and controlled by the Gods. It is no wonder, then, that music was omnipresent at the Pythian Games, the Olympic Games, religious ceremonies, leisure activities, and even the beginnings of drama as an outgrowth of the dithyrambs performed in honor of Dionysus. It may be that the actual sounds of the music heard at rituals, games, dramas, etc. underwent a change after the traumatic fall of Athens in 404 B.C. at the end of the first Peloponnesian War. Indeed, one reads of the "revolution" in Greek culture, and Plato's lament that the new music "...used high musical talent, showmanship and virtuosity...consciously rejecting educated standards of judgement." Although instrumental virtuosity was prized, this complaint included excessive attention to instrumental music such as to interfere with accompanying the human voice, and the falling away from the traditional ethos in music. 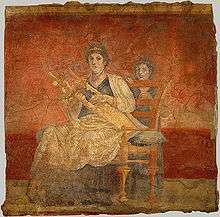 the lyre: a strummed and occasionally plucked string instrument, essentially a hand-held zither built on a tortoise-shell (chelys) frame, generally with seven or more strings tuned to the notes of one of the modes. The lyre was used to accompany others or even oneself for recitation and song. It was associated with an aristocratic upbringing and the cult of Apollo. the kithara, also a strummed string instrument, more complicated than the lyre. It had a box-type frame with strings stretched from the cross-bar at the top to the sounding box at the bottom; it was held upright and played with a plectrum. The strings were tunable by adjusting wooden wedges along the cross-bar. It is one possible origin of the contemporary guitar. the barbitos, a taller lyre considered to be the least complicated, often associated with satyrs. The hydraulis. Note the presence of the curved trumpet, called the bukanē by the Greeks and, later, cornu by the Romans. the aulos, usually double, consisting of two double-reed (like an oboe) pipes, not joined but generally played with a mouth-band to hold both pipes steadily between the player's lips. Modern reconstructions indicate that they produced a low, clarinet-like sound. There is some confusion about the exact nature of the instrument; alternate descriptions indicate single-reeds instead of double reeds. 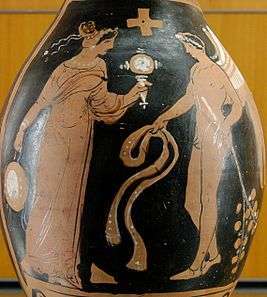 It was associated with the cult of Dionysus. the Pan pipes, also known as panflute and syrinx (Greek συριγξ), (so-called for the nymph who was changed into a reed in order to hide from Pan) is an ancient musical instrument based on the principle of the stopped pipe, consisting of a series of such pipes of gradually increasing length, tuned (by cutting) to a desired scale. Sound is produced by blowing across the top of the open pipe (like blowing across a bottle top). And rouse to dare their fate in honourable arms. Not with his trumpet only, but his spear. 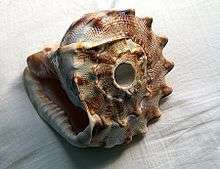 We can assume that the Greeks and Trojans of whom Virgil speaks made use not only of the conch—a sea shell with a cut opening as a mouthpiece—but even of the salpinx' ("...With breathing brass to kindle fierce alarms..."). 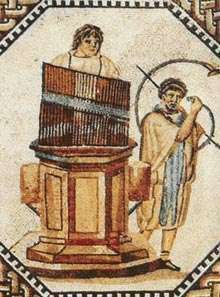 The lyre, kithara, aulos, hydraulis and salpinx all found their way into the music of ancient Rome. Even into the 18th century, music and mathematics shared a close relationship, such that writers like Rene Descartes and Leonhard Euler wrote mathematical treatments of music. This goes back to some of the earliest roots of both disciplines. It is most pronounced in the enigmatic Ancient Greek figure of Pythagoras, who with mathematical devotion laid the foundations of our knowledge of the study of harmonics—how strings and columns of air vibrate, how they produce overtones, how the overtones are related arithmetically to one another, etc. It was common to hear of the "music of the spheres" from the Pythagoreans. Our music was once divided into its proper forms...It was not permitted to exchange the melodic styles of these established forms and others. Knowledge and informed judgment penalized disobedience. There were no whistles, unmusical mob-noises, or clapping for applause. The rule was to listen silently and learn; boys, teachers, and the crowd were kept in order by threat of the stick. . . . But later, an unmusical anarchy was led by poets who had natural talent, but were ignorant of the laws of music...Through foolishness they deceived themselves into thinking that there was no right or wrong way in music, that it was to be judged good or bad by the pleasure it gave. By their works and their theories they infected the masses with the presumption to think themselves adequate judges. So our theatres, once silent, grew vocal, and aristocracy of music gave way to a pernicious theatrocracy...the criterion was not music, but a reputation for promiscuous cleverness and a spirit of law-breaking. 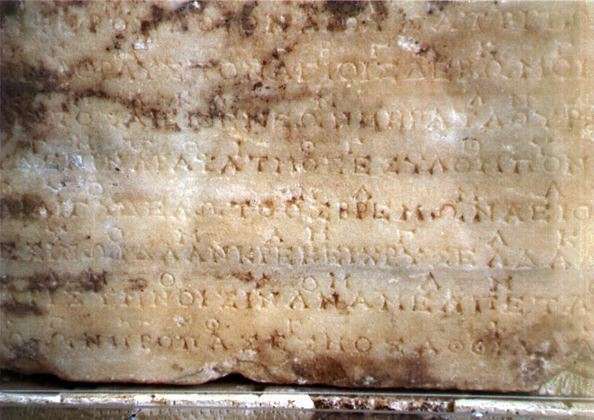 Photograph of the original stone at Delphi containing the second of the two hymns to Apollo. The music notation is the line of occasional symbols above the main, uninterrupted line of Greek lettering. From his references to "established forms" and "laws of music" we can assume that at least some of the formality of the Pythagorean system of harmonics and consonance had taken hold of Greek music, at least as it was performed by professional musicians in public, and that Plato was complaining about the falling away from such principles into a "spirit of law-breaking". The sounds of scales vary depending on the placement of tones. Modern Western scales use the placement of whole tones, such as C to D on a modern piano keyboard, and half tones, such as C to C-sharp, but not quarter-tones ("in the cracks" on a modern keyboard) at all. This limit on tone types creates relatively few kinds of scales in modern Western music compared to that of the Greeks, who used the placement of whole-tones, half-tones, and even quarter-tones (or still smaller intervals) to develop a large repertoire of scales, each with a unique ethos. The Greek concepts of scales (including the names) found its way into later Roman music and then the European Middle Ages to the extent that one can find references to, for example, a "Lydian church mode", although name is simply a historical reference with no relationship to the original Greek sound or ethos. A representation from the 1500s of the Muses dancing. From the descriptions that have come down to us through the writings of those such as Plato, Aristoxenus and, later, Boethius, we can say with some caution that the ancient Greeks, at least before Plato, heard music that was primarily monophonic; that is, music built on single melodies based on a system of modes/scales, themselves built on the concept that notes should be placed between consonant intervals. It is a commonplace of musicology to say that harmony, in the sense of a developed system of composition, in which many tones at once contribute to the listener's expectation of resolution, was invented in the European Middle Ages and that ancient cultures had no developed system of harmony—that is, for example, playing the third and seventh above the dominant, in order to create the expectation for the listener that the tritone will resolve to the third. Yet, it is obvious from the following excerpt from Plato's Republic that Greek musicians sometimes played more than one note at a time, although this was apparently considered an advanced technique. The Orestes fragment of Euripides seems to clearly call for more than one note to be sounded at once. Research in the field of music from the ancient Mediterranean—decipherings of cuneiform music script—argue for the sounding of different pitches simultaneously and for the theoretical recognition of a "scale" many centuries before the Greeks learned to write, which they would have done before they developed their system for notating music and recorded the written evidence for simultaneous tones. All we can say from the available evidence is that, while Greek musicians clearly employed the technique of sounding more than one note at the same time, the most basic, common texture of Greek music was monophonic. Dionysius of Halicarnassus, Comp. 63 f.
A 17th-century representation of the Greek muses Clio, Thalia and Euterpe playing a transverse flute, presumably the Greek photinx. ↑ Ulrich and Pisk, p. 16. ↑ Edmond Pottier (1908). Douris and the Painters of Greek Vases. p. 78. ↑ Ulrich and Pisk, p. 15. ↑ In the Politics (1341a), Aristotle describes the kithara as an organon technikon, or an artist's instrument, requiring training. ↑ Plato, Laws 700-701a. cited in Wellesz, p. 395. ↑ Plato, Republic, cited in Strunk, pp. 4-12. ↑ Plato, Laws 812d., cited in Henderson, p. 338. Aristoxenus (1902). The Harmonics of Aristoxenus, translated by H. S. Macran (Oxford, Calrendon; facs. Hildesheim, G. Olms, 1974). Boethius (1989). Fundamentals of Music (De institutione musica), translated by Calvin Bower. edited by Claude Palisca, New Haven and London: Yale University Press. Calter, Paul (1998). "Pythagoras & Music of the Spheres". Course syllabus, Math 5: Geometry in Art and Architecture, unit 3. Dartmouth .edu (accessed 1 October 2014). Graves, Robert (1955). The Greek Myths. Mt. Kisco, New York: Moyer Bell. Henderson, Isobel (1957). "Ancient Greek Music". In The New Oxford History of Music, vol.1: Ancient and Oriental Music, edited by Egon Wellesz, pp. 336–403. Oxford: Oxford University Press. Kilmer, Anne Draffkorn, and Richard L. Crocker. (1976) Sounds from Silence: Recent Discoveries in Ancient Near Eastern Music. (CD BTNK 101 plus booklet) Berkeley: Bit Enki Records. Olson, Harry Ferdinand. (1967). Music, Physics and Engineering, second edition. New York: Dover Publications. ISBN 0-486-21769-8. Strunk, Oliver; Leo Treitler, and Thomas Mathiesen (eds.) (1997). Source Readings in Music History: Greek Views of Music, revised edition. New York: W.W. Norton & Company. Trehub, Sandra (2000). "Human Processing Predispositions and Musical Universals". In The Origins of Music, edited by Nils L. Wallin, Björn Merker, and Steven Brown,. Cambridge MA: MIT Press. Ulrich, Homer, and Paul Pisk (1963). A History of Music and Musical Style. New York: Harcourt Brace Jovanoich. Virgil (1830). The Eclogues Translated by Wrangham, the Georgics by Sotheby, and the Æneid by Dryden, edited by William Sotheby. 2 vols. London. Reprinted, New York: Harper & Brothers, 1834. Virgil (1909). Virgil's Æneid, translated by John Dryden. The Harvard Classics, edited by C. W. Eliot. New York: P. F. Collier & Son. Virgil (1938). The Aeneid of Virgil, translated by John Dryden, selections, edited by Bruce Pattison. The Scholar's Library. London: Macmillan Publishers. Virgil (1944). Virgil, the Æneid, translated by John Dryden with Mr. Dryden's introduction; illustrated by Carlotta Petrina. New York: Heritage Press. Reissued Norwalk, Connecticut: Heritage Press, 1972. Virgil (1975). The Aeneid of Virgil, in the Verse Translation of John Dryden, illustrated with the woodcuts of John Grüninger. The Oxford Library of the World's Great Books. Franklin Center, Pa.: Franklin Library. Reissued 1982. Virgil (1989). Vergil's Aeneid and Fourth ("Messianic") Eclogue, translated by John Dryden, edited, with introduction and notes, by Howard W. Clarke. University Park: Pennsylvania State University Press. ISBN 0-271-00651-X. Virgil (1997). Aeneid, translated by John Dryden, with an introduction by James Morwood. Wordsworth Classics of World Literature. Ware: Wordsworth Editions. ISBN 1-85326-777-5. Wellesz, Egon (ed.) (1957). Ancient and Oriental Music. New Oxford History of Music 1. Oxford and New York: Oxford University Press. Reprinted 1999. ISBN 0-19-316301-2. Williams, C. F. (1903). The Story of the Organ. New York: Charles Scribner & Sons. Detail from Piero di Cosimo's 16th-century version of Perseus rescuing Andromeda. The instrument in the hands of the musician is an anachronism and appears to be an imaginary medieval combination of a plucked string instrument and bassoon. Anderson, Warren D. (1966). Ethos and Education in Greek Music: The Evidence of Poetry and Philosophy. Cambridge, Mass. : Harvard University Press. Anderson, Warren D. (1994). Music and Musicians in Ancient Greece. Ithaca and London: Cornell University Press. ISBN 0-8014-3083-6 (cloth); ISBN 0-8014-3030-5 (pbk). Barker, Andrew (ed.) (1984–89). Greek Musical Writings, 2 vols. Cambridge Readings in the Literature of Music. Cambridge: Cambridge University Press. Limited preview of vol. 1 online. Bundrick, Sheramy (October 17, 2005). Music and Image in Classical Athens. Cambridge University Press. Comotti, Giovanni. (1989). Music in Greek and Roman Culture. Baltimore: Johns Hopkins University Press. ISBN 0-8018-3364-7. Hagel, Stefan. (2009). Ancient Greek Music: A New Technical History. Cambridge and New York: Cambridge University Press. ISBN 978-0-521-51764-5. Landels, John G. (1999). 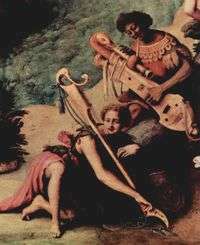 Music in Ancient Greece and Rome. London and New York: Routledge. ISBN 0-415-16776-0 (cloth); ISBN 0-415-24843-4 (pbk reprint, 2001). Limited preview online. Lord, Albert B. (1960). The Singer of Tales. Cambridge: Harvard University Press. Maas, Martha, and Jane McIntosh Snyder (1989) Stringed Instruments of Ancient Greece. New Haven: Yale University Press. ISBN 0-300-03686-8. Limited preview online. Mathiesen, Thomas J. (1999). 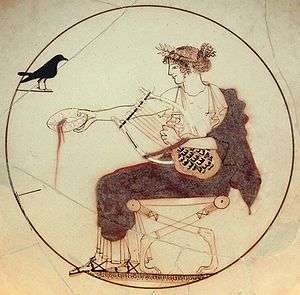 Apollo's Lyre: Greek Music and Music Theory in Antiquity and the Middle Ages. Lincoln, NE: University of Nebraska Press. Limited preview online. Mathiesen, Thomas J. (1974). Bibliography of Sources for the Study of Ancient Greek Music. New Jersey: Joseph Boonin, Inc.
Monro, David Binning (1894). The Modes of Ancient Greek Music. Oxford: Clarendon Press. Republished as an unabridged facsimile by Elibron, limited preview online. Murray, Penelope, and Peter Wilson (eds.) (2004). Music and the Muses: The Culture of 'Mousike' in the Classical Athenian City. Oxford and New York: Oxford University Press. ISBN 0-19-924239-9. Limited preview online. Pöhlmann, Egert, and Martin L. West (2001). Documents of Ancient Greek Music: The Extant Melodies and Fragments Edited and Transcribed with Commentary. Oxford: Clarendon Press. ISBN 0-19-815223-X. Sachs, Curt. (1943). The Rise of Music in the Ancient World. NY: W.W. Norton & Company, Inc.
Webster, T. B. L. (1970). The Greek Chorus. London: Methuen anc Co. Ltd. ISBN 0-416-16350-5. Winnington-Ingram, R. P. (1968). Mode in Ancient Greek Music. Amsterdam: Adolf M. Hakkert. Ensemble Kérylos, a music group led by scholar Annie Bélis and dedicated to the recreation of ancient Greek and Roman music. Ancient Greek music at the Austrian Academy of Sciences. Audio-edition of the published fragments; reconstructed instruments played. A modern reconstruction of an ancient hydraulis.